Manley Hall, built in 2002, replaced the O’Connor Mansion, deemed structurally unsafe after the 1989 earthquake. 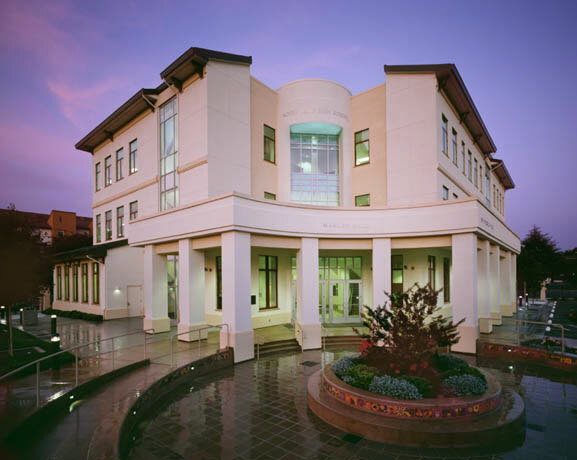 Located in the heart of Silicon Valley, Notre Dame High School, San Jose, CA is a part of another story which began over 170 years ago at the port of Antwerp in Belgium. Having waited for weeks for the winds to propel l’Infatigable, six Sisters of Notre Dame de Namur (SNDdeN) set sail for the faraway land of Oregon. In 1844, they opened a small mission in the Willamette Valley for children of the Chinook tribes and early settlers. The Oregon mission, however, met innumerable challenges and closed when the Sisters accepted an invitation to found a mission in California where needs were growing faster in the capital of San Jose. In 1851, the Sisters established a college and a day school on Santa Clara Street with 180 Catholic and 75 non-Catholic students of Native American and European families. With donations from clergy and city leaders, the Notre Dame schools grew along this “avenue of willows.” In 1927, the day school moved to the O’Connor Mansion and became the current Notre Dame High School, San Jose (NDSJ) and the college moved north to Belmont. 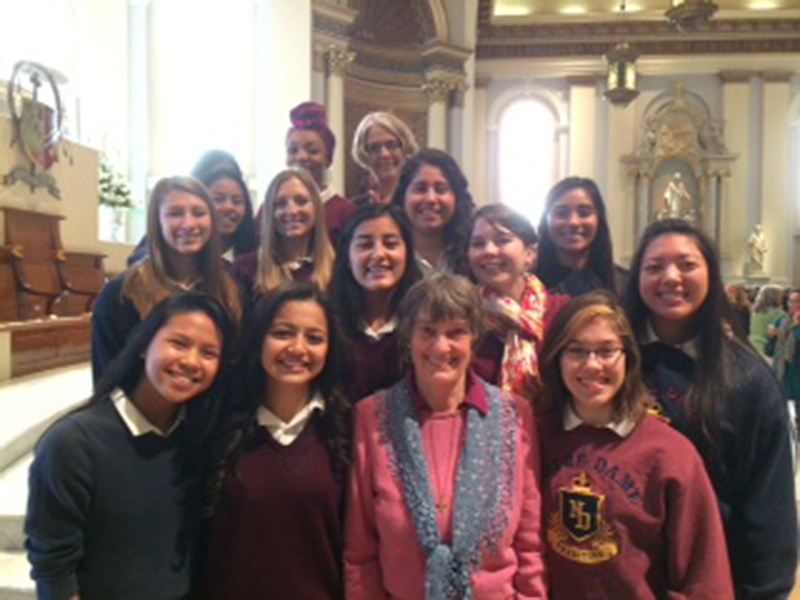 Sr. Carol and NDSJ students celebrate Catholic Schools’ Week in St. Joseph Cathedral in downtown San Jose, CA. As the oldest all-girls’ high school west of the Mississippi, NDSJ, rich in tradition, flourished through two centuries with the help of many individuals who supported the SNDdeN Mission. Yet the years were not without challenge and risk-taking. With the necessary removal of the O’Connor Mansion in 2002, the future of NDSJ required the same courage and determination found in our early Sisters. The faculty and staff imagined and planned for a multi-cultural learning community in an urban landscape. With vision and funding provided by friends and benefactors, Manley Hall, a new building, became a reality in October 2002 and gave impetus to a renewed vision for young women in the 21st century.